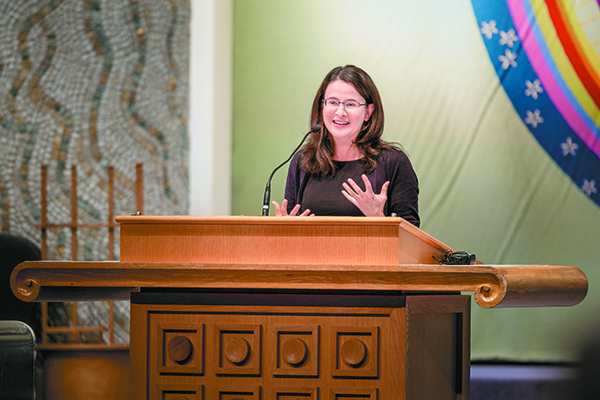 On Monday, May 15, Temple Israel and The Well welcomed guest speaker Sarah Hurwitz, who recently completed eight years in the White House as chief speechwriter for First Lady Michelle Obama. Hurwitz also served as a speechwriter for President Barack Obama, and as chief speechwriter for Hillary Clinton’s 2008 presidential campaign. An enthusiastic, intergenerational crowd gathered to hear Hurwitz offer reflections on her time in the Obama administration, practical tips on speechwriting and forging a career in government and, more personally, speaking about the power and guidance of Jewish tradition in creating a just society. Jewish stories, Hurwitz argued, remind Jews what it’s like to be at the mercy of others, which, in turn, commands the creation of a society that is nothing like biblical Egypt. 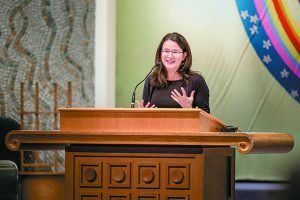 Hurwitz saw this in action while working within the Obama administration and was an integral part of conveying messages of human dignity and integrity to the world through the speeches she crafted.